The Boston Celtics announced Wednesday evening that Brad Stevens (formerly the head coach at Butler University) had been hired to replace Doc Rivers as head coach. The move came as a surprise to many, although much of the surprise came from how unexpected the move was. There are many high-profile coaches currently unemployed, including Stan Van Gundy and 2013 NBA Coach of the Year George Karl, and Stevens had not been rumored to be a potential candidate for any of the openings over the last two months. But given the Celtics obvious re-building effort over the next few years (evidenced by parting ways with Doc Rivers, Paul Pierce, and Kevin Garnett), Stevens is about as close to a perfect coaching hire as one could expect. He's a low-risk, but high-reward coach. Just 36 years old, he's younger than 17 players who were in the league in 2013, and he's by far the youngest head coach in the league. In a best-case scenario, he spends his first year or two learning how to coach at the NBA level, and by the time the Celtics are ready to compete at a championship level (or close), he's developed enough to be a coach that can maximize his team's talent (like Erik Spoelstra has done in Miami). In a worst-case scenario, he flames out, but would leave very few adverse side-effects, given that (a) he's considerably less expensive than a more high-profile coach (like the aforementioned Stan Van Gundy or George Karl), and (b) the two years in which he'd be flaming out are years in which the Celtics have no expectation of competing for a playoff spot, let alone a championship. However, all available evidence seems to suggest he'll be a strong NBA coach. For one, he's very receptive to analytics and other advanced statistics, going so far as hiring statistician Drew Cannon to his Butler coaching staff as a graduate manager (there has been no word as to whether or not Cannon will join Stevens on the Celtics' coaching staff). With so much of player acquisition and team-assembling being influenced by statistical analysis, it's only a matter of time before the same principles are introduced into the coaching ranks. The Dallas Mavericks have been on the forefront of this, employing Roland Beech (founder of the basketball stats site 82games.com) as their Director of Basketball Analytics, and offering him a spot on their bench during games. But Beech has never officially been a member of the coaching staff; Cannon could become the first. In addition to the statistics, Stevens has shown to be an innovative coach in the college ranks, blending together a number of different philosophies in order to be competitive with a roster that is often considerably less talented than those from power conferences. Stevens was able to lead Butler to the National Championship Game in consecutive years (where they lost to Duke in 2010 and Connecticut in 2011). 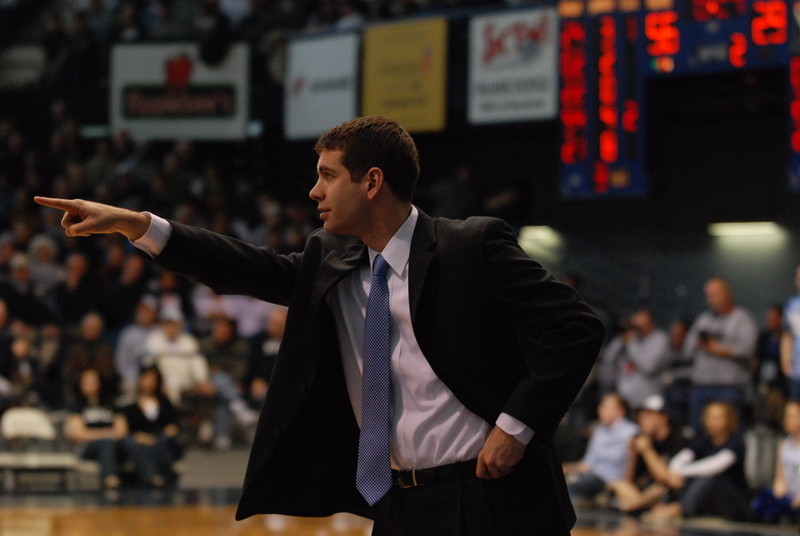 Brad Stevens very well may be the cutting edge of NBA coaching. Combining his X's and O's innovation with not only an openness to advanced analytics, but a desire to identify and respond to that information puts him in stark contrast to every other head coach currently employed. Whether he's able to succeed at the NBA level obviously remains to be seen, but there is every reason to be optimistic.